Today I got relatively little accomplished. I read Lisa Shearin’s The Grendel Affair, which was really excellent and you should go read it right now. I liked the characters, the concept, and the worldbuilding. Good action and great camaraderie among the cast of characters. I stayed up ridiculously late reading it. So now I’m telling you to do the same. The really good news is that one of the gastroenterologist’s offices that I’ve been trying to get my son seen at called today with a cancellation tomorrow. So he’s finally going to get in. I’m so glad. My stomach is in a constant state of hurt this week. It’s all about worry. I hope we can make progress toward getting some answers. I tried to call the insurance company to see if they would cover this doctor in network, but they were out. So I’ll be calling again. But in the meantime, he’ll be seen. I went searching for a food grade 5 gallon bucket today. They are not so easy to find. The brewery supply place I went to was out. All the natural grocers didn’t have any. I need it to put wheat into. I grind my own for bread. I buy it in bulk, so I need a way to store it. I didn’t make any reading goals for this year. I read less than I did when I was younger. I miss reading more. Last year I kept count of the books I read (for the most part) and read 32 books. There was at least one month where I read no books. What?!!! Still, 32 books, though not that many, is somewhat more than I feared I was reading. But I’m still going to try to read more. Just I need to find the balance. I wonder–anybody up for doing a book club reading for the next few months? Read some books together again? One day down, two days left of this semester. Did my last faculty senate meeting today. That’s six years out of seven that I’ve served. I’m ready for a break. Kind of interested in a different committee though. Might talk to someone about it. People looked at the house today but have decided to go with acreage I guess. Depressing. But at least the house is clean. I wrote a page today on the WIP and don’t like it at all. I think it’s going too slow and that my main character isn’t quite right. She’s a bit cardboardy. At least on the page, though not in my head. I want to go dig crystals, but I don’t know if Crystal Park is open yet. My feeling is that it should be and the roads should be open. We haven’t had that much snow. I haven’t planned a book club book for May. I wasn’t sure anyone was up for it. Maybe start again in the fall? What do you think? I’m reading Thieftaker right now. Or rather, I started it, but then got caught up in other stuff and now I have to go back to it. I keep wondering how my house shows in comparison with other houses. I know it’s old–1917. But it’s in really good shape with a lot of the original woodwork and fixtures. Sure, some of my room paints are on the bold side, but the kitchen is only 4 years old. I know we only have 1.5 baths, but I feel like there ought to be more interest. I just wish I could figure out what the deal is. We supposedly aren’t overpriced, but yet we aren’t getting much looks. And we’ve lowered the price. Emptied off a bunch of my DVR recordings. Decided I was never going to watch this season of Person of Interest. I also deleted my Havens. I like the show but– well, I want to read more and write more. My folks are going to be visiting for a few days. I’m looking forward to that. At least the house will be clean for them. I have to say that I loved this book. I want to dig in and talk about so much but I don’t know where to begin. I would love first to hear about your reactions, I think. I can imagine this book didn’t appeal to everyone. Even if you haven’t finished yet, do say what you’re thinking. This was one of those books I read largely in one sitting. Part of that was because I started it, then started teaching again, and had a bunch of life stuff. But part of it was that once I started, I realized I wanted to read it straight through. It’s a complex book told in wonderful prose that looks deceptively simple but is not in any way. So let’s begin with your thinking and your reactions. Talk to me. Lay it all out. Go! 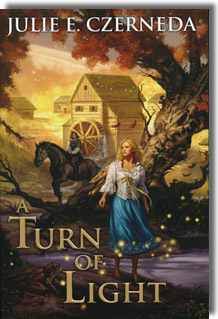 Tomorrow we discuss A Turn of LIght by Julie Czerneda for book club. Wheee! I will say, however, that because of unexpected soccer scheduling (as in we just got the schedule for tomorrow), we’ll have to start in the afternoon, if that’s all right. You ever had one of those days where it feels all your nerves are exposed and getting pecked at by woodpeckers? That was my day. I’m seeking calm now. Sadly, eating myself into a stupor doesn’t seem like a good idea (I don’t have the chocolate for it anyhow), and I’ve never been good at drinking when I’m upset (I only get sick), and when I try meditation, there’s frequent moments of Squirrel! So I’m on the couch with a book (well, as soon as I’m done here) and dogs and tea and quiet. We’ll see if that works. Tomorrow will be exercise. I want to take the dogs for a long ramble, just as soon as I buy new leashes, since their old ones have vanished (what was that? One of the woodpeckers? Yes). Poor things. I got them all prepped to go tonight and no leashes to be found. I discovered that one promptly chewed through a soaker hose in revenge. Gotta get stuff to fix that next, I spose. Sing the chorus loud when you get there. For me. Wait for it. You’ll know what it is. You all have not made it at all easy to make a choice about what story to write. You know that don’t you? Is that on purpose? Are you trying to drive me crazy? That is, crazier? I think what I will do is make a plan to write several Horngate stories/novellas this year. Without knowing what will be happening in my life, it’s tough to plan, and not knowing what I will have to be working on as far as deadlines makes that worse. Plus I’m working on another novel proposal. All the same, I want to keep busy and do some more exploring of the Horngate world. What will I work on first? I don’t know. On the life implosion front, my dad has an arrhythmia. According to the doc he has a valve issue. They are going to do an angiogram to see what’s causing it and to also look at the bypasses he had in 1995. It was a six way bypass. If there are no problems with those, then they will take measurements and later go back and install a new valve through the artery (an angio procedure). If the bypasses are problematic, they will do open heart surgery and fix things. Or so the plan is now without having an inside look. My dad is 83 with a pacemaker. So I’m just a little bit concerned. As in, freaking out and trying not to because really, none of this will happen until late in May or into June. Hard to sustain panic for that long, so I guess I’ll have to nurse it. Sigh. Don’t forget we’re having our Turn of Light Discussion this Saturday. Have you been reading???? I meant to post this yesterday, but thinks got out of control. Sorry about that. The winner for next time around is . . .
Julie Czerneda‘s A Turn of Light. I’m looking forward to it. There are talking toads. This harkens back to the sense of wonder fantasy that I have always loved and we don’t see that much of anymore. Spread the word and invite anybody who wants to, to join us. Our next discussion day is April 13th. Mark it on your calendars! I also crossed the halfway threshold on my weight lost. It’s take me almost 2 years to get here. But at least it’s coming off and so far, staying off. I actually want to lose/need to lose more than my goal weight, but I figured an initial goal weight that wasn’t screaming terrifying. Just . . . terrifying. At least I’ve made it halfway. I’m right now managing to lose at the rate of about 1.5 lbs per month, give or take. As the weather improves, that might improve since I can actually get outside and walk more, as opposed to using the elliptical. Thanks to everyone on the good wishes regarding my uncle. I very much appreciate it. Time to vote on the next book club book! Are your ready to pick? We don’t have many nominations, but they are great nominations, so let’s get to voting. In other news, I finished the revision on my proposal chapters today and sent them off to my agent. Now to finish doing the tax stuff, finish the synopsis, and work on prepping my next class, and oh, start another project. Yep, not busy at all. I think I’ll read instead. Let’s get this vote done by Saturday. Also, there’s a puppy in need of help. Here’s his story. If you are feeling inclined to help, please do. There’s nothing worse than having someone you love and who depends on you be ill and you can’t help. Posted in book club, WIP, Writing Process Comments Off on Time to vote on the next book club book! Today was one of those days. You know, the blue ones. I ended up being not only unproductive, but well, bad head space. Girlie stayed home sick today. Sore throat and hurting stomach. But she will be going back to school tomorrow. It snowed today–a heavy, thick storm–that lasted about 15 minutes and promptly melted off. The neighbor’s roof was steaming after. Don’t forget to put in your nomination for next book club read. Come on! You know you want to join in! It’s an excuse to read fun books! I get to see the man in about 3 weeks. It will have been 3 months at that point. In the meantime, the dogs have decided it’s time to shed, with great enthusiasm. I’ve been working on revising. Cutting and changing things. Tell me, what do you imagine when you read the word: torlynx? It’s an animal. Help me out here. Tell me what pops into your head. Okay, opening up the book nominations. Pick a book published since Jan. 1, 2012, preferably something you haven’t read. Anything is fair game. Nominations are open until Thursday at noon, and then we’ll start voting. The next discussion will be a little bit later, on April 13th. So lots of time to get reading. I’m going to nominate Thieftaker by DB Jackson (aka David Coe). Ah, love me some Johnny Cash (via Kris Kristofferson with that song). I want to remind you all that you can listen to the first three Crosspointe books at Audible.com. And the fourth will come soon, along with the three Path books. I want to hear what you think of the Audible version. I’m a little sad we had so little turnout on the book club. I love these discussions and I hope more can make it next time. Tomorrow we’ll start looking for our next nomination. This time we’ll go with something released since January of 2012. Preferably something you haven’t read. We had someone take a second look at the house. Waiting to hear if anything is going to come of that. Trying not to think about it a whole lot.